In 1936, Dr. James Naismith, basketball’s inventor, attended the Indiana high school championship game between Frankfort and Fort Wayne Central. 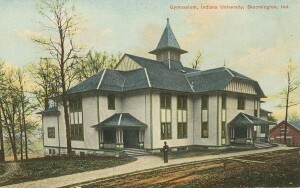 In his first exposure to Hoosier Hysteria, he recalled that the sight of the stadium “packed with fifteen thousand people, gave me a thrill I shall not soon forget.” During his visit, Naismith told an Indianapolis audience: “Basketball really had its beginning in Indiana which remains today the center of the sport.” Expanding upon this comment, Naismith associated Indiana’s national distinction in basketball with the popularity and success of the state high school basketball tournament. The Indiana high school basketball tournament began in 1911, when Crawfordsville High School (C.H.S.) defeated Lebanon High School for the state title. This post provides an historical examination of the first Indiana high school basketball champions’ season, and the beginning of one of Indiana’s most cherished cultural traditions. In 1900, C.H.S. organized one of the earliest high school basketball teams in Indiana. Unfortunately, finding high school opponents in the nascent years of the sport in the Hoosier state often proved difficult. During the 1901-02 season, Crawfordsville defeated Indianapolis’ Shortridge High School, the lone high school team on their schedule. In the opinion of the C.H.S. team, this victory gave them “the championship of the High Schools of Indiana in basketball.” They justified this claim because they defeated Shortridge, and Shortridge defeated Indianapolis’ Manual Training High School. A Crawfordsville newspaper issued a standing challenge on behalf of the local team, “They are willing to defend their title any time and any where,” but no other challengers came calling. More high schools began playing basketball in the subsequent years. In 1907, C.H.S. again styled themselves “the state champions” after finishing the season undefeated, but this time four high schools numbered among their opponents. 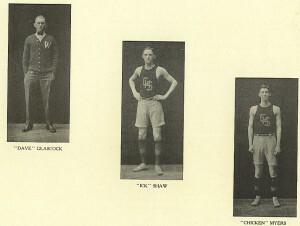 By the 1908-09 season, all but two of C.H.S.’s opponents were high schools. Lebanon High School debuted on C.H.S.’s schedule that season. Although Lebanon finished with a 22-2 record, both their losses came against Crawfordsville. Because of this, the Lebanon Patriot conceded that Crawfordsville could claim the title of “state champions” yet again. A contemporary basketball practice. 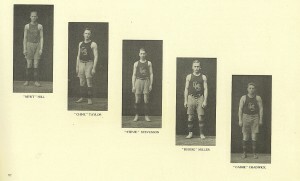 Image source: Purdue University yearbook The Debris for 1912. Lebanon proposed a solution, and challenged Crawfordsville to a third game on a neutral court to decide the state champion. If Lebanon won they could justly claim the “state title” by virtue of having defeated Crawfordsville twice, and having the overall better winning percentage. Conversely, if Crawfordsville won the third game their claim to the title could no longer be questioned. Crawfordsville refused a re-match. 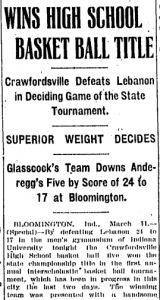 The controversy over the “state championship” of 1909-10 created strong enmity between the neighboring high schools of Crawfordsville and Lebanon. After Crawfordsville declined to play a third game, Lebanon proceeded to discredit “the motives and actions” of their rival. C.H.S., in turn, threatened to file charges with the Indiana High School Athletic Association’s (IHSAA) Board of Control, charging Lebanon with “unsportsmanlike conduct and unfair criticism.” Thus, the Crawfordsville-Lebanon rivalry was born. Coach Glascock and two of his starters: Clio Shaw and Ben Myers. Image Source: Crawfordsville High School yearbook 1911. The “state championship” controversy demanded a solution. Although the IHSAA began in 1898, the Indiana University Booster Club organized the first Indiana high school basketball tournament. It planned the event to take place at Indiana University in March 1911. The Booster Club’s proposal called for a twelve-team tournament, which would include the teams with the best records from Indiana’s congressional districts. The tournament winner would receive “a suitable trophy, emblematic of the state championship,” and thereby quash any debate as to which team was the rightful title holder. As impressive as C.H.S.’s team and individual successes were, they still had four games to play to prove that they were Indiana’s best. The teams invited to the “First Annual State Interscholastic Basket Ball Tournament” at Bloomington included Anderson, Bluffton, Crawfordsville, Evansville, Lafayette, Lebanon, Morristown, New Albany, Oaktown, Rochester, Valparaiso, and Walton. The tournament teams and fans convened at Indiana University’s original Assembly Hall on Friday, March 10. In the first round of play, New Albany eked past Rochester, 19-18, “Walton walloped Morristown,” 31-23, Bluffton carried “off the bacon” against Evansville, 38-23, Lafayette “romped away from” Oaktown, 31-14, and Lebanon defeated Valparaiso, 23-11. 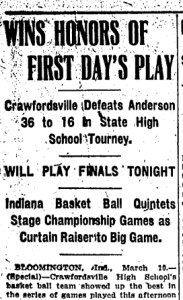 Crawfordsville’s first round game was against Anderson High School. The game remained competitive in the first half, and at half-time Crawfordsville led 14-10. The pace changed dramatically in the second half. The Anderson Herald described, “The Crawfordsville quintet showed [a] burst of varsity playing which swept the Anderson players off their feet and the ball fell into the basket with great rapidity.” Crawfordsville went on a 22-6 run in the second half, as the “Blue and Gold” won, 36-16. On Saturday, March 11, Lebanon began the second round of tournament play against New Albany at 9 a.m. Although it took fifteen minutes for either team to score, Lebanon led 14-3 at the half, and at the end of regulation Lebanon triumphed, 28-10. Following that game, Bluffton took the floor versus Lafayette at 10 o’clock. In a game “replete with sensational floor work and fine basket shooting,” Bluffton defeated Lafayette, 34-22. Some members of the Crawfordsville team. Image source: Crawfordsville High School yearbook for 1911. The next game tipped at 11 a.m., and matched Crawfordsville against tiny Walton High School from Cass County. The Daily Student reported, “The first half proved a soul stirrer [with] both teams fighting savagely on the floor.” The half ended with Crawfordsville leading 16-10. In the second half, and held Walton field goalless. Myers continued to shine offensively for Crawfordsville, “playing a speedy, heady and nervy game,” en route to fifteen points. Myers’ teammates, Miller, Hill, and Taylor combined for sixteen more points as Crawfordsville advanced past Walton, 31-12. Instead of a final four, the first Indiana state high school basketball tournament had a final three, a product of seeding the tournament with twelve teams. Tournament organizers held a drawing with Bluffton, Crawfordsville, and Lebanon to determine which teams would play next, and which team would receive a bye into the final round. The story of Indiana’s first basketball tournament would lose much of its intrigue if Lebanon and Crawfordsville met in the semi-final game. As chance would have it, Lebanon drew the bye, and advanced to await the winner of Crawfordsville v. Bluffton for the championship. In their first two tournament games, Bluffton averaged 36, but their defense surrendered 5.5 points more than their regular season average. Injuries to key Bluffton players, sustained in their quarterfinal game against Lafayette, further weakened the team. Bluffton’s top-two scorers in the regular season, Doster Buckner and Dwight Fritz, hobbled into the game against Crawfordsville on sprained ankles.Bluffton did what they could against Crawfordsville, and “fought gamely all throughout the fray.” Yet, Bluffton’s scrappiness could not contain Crawfordsville’s “tall, husky lads.” Crawfordsville led 21-7 at the half, and easily won the game, 42-16. Myers again led the offense with sixteen points, despite receiving a “deep gash on his forehead” after colliding with Bluffton center Claude Ware. “Chine” Taylor had his strongest tournament showing with six field goals. Carroll Stevenson saw his first tournament action in the second half, and exhibited no ill effects from his injury, finishing with 12 points. In defeat, Bluffton’s Homer Brumbaugh led his team in scoring with 10 points. After all the antagonism expressed between Lebanon and Crawfordsville the previous three seasons, it was only fitting that these two squads met in the finals. 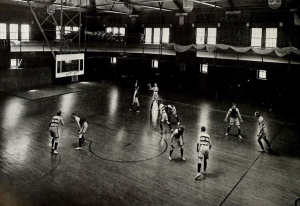 The high school championship would be decided that evening (March 11); “played as a curtain-raiser” to Indiana University’s regular season finale against Northwestern University. Entering the contest Lebanon had a clear advantage of a nine-hour rest, after defeating New Albany earlier that morning. Crawfordsville, on the other hand, must have felt fatigued preparing for their third game in eight hours. Crawfordsville High School’s basketball team’s three year run of “state championships” would end the next season. C.H.S. finished the 1911-12 season with an 11-4 record, but “for the first time in the school’s history, [their] colors fell before Lebanon,” not once, but twice. If that was not enough humiliation, Clinton High School clinched the district invitation to the tournament, and thereby denied Crawfordsville High School the opportunity to defend the state title in 1912, which Lebanon, incidentally won. Furthering the irony, the 1912 tournament was the first Indiana high school basketball tournament that the IHSAA sanctioned. Consequently, Lebanon, for many decades, claimed to be the first IHSAA basketball tournament champion. In 1957, Crawfordsville High School found their place in Indiana basketball history restored. The IHSAA accepted a resolution from Indiana University, whereby the university transferred its claim to recognition of the first Indiana high school basketball championship to the IHSAA’s Board of Control “for inclusion in the official records of that body.” At halftime of the forty-seventh annual high school basketball championship, played between South Bend Central and Indianapolis’ Crispus Attucks at the Butler University Fieldhouse, the IHSAA recognized Crawfordsville’s 1911 high school basketball team as Indiana’s first state tournament champions. For that feat, and for being the first state tournament champion, they will be remembered as long as high school basketball is played and celebrated in Indiana. 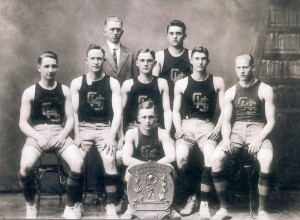 This blog post is excerpted by the author from a more detailed essay about Crawfordsville’s 1911 state basketball championship.